In my last entry, I wrote about how you can get free bitcoin online from Bonus Bitcoin Faucet. Just like there are several opportunities of earning free bitcoins on Bonus Bitcoin Faucet, here I will present to you yet another powerful faucet that offer you bitcoin cash every five minutes. All you have to do is wait every five minutes to claim your bitcoins on the site. There is no better way to enter into the world of bitcoin trading than this. You don't need any initial capital investment. The only investment is the money you spend on data subscriptions in order to access the website I will be talking about here. The bitcoin faucet I'll be talking about here is called Moonbitcoin cash. It is a faucet that is connected with Coinpot.co So if you don't already have a Coinpot account, you should create one right away. Once you have you Coinpot account ready, you can navigate to moonbitcoin cash and use the same email address you used for Coinpot to sign in to the faucet. The question is, why do this faucet give you units of bitcoin just for visiting the site. When you visit the site, you'll see different advertisement displayed. These advertisements are placed there by different site owners. To placed the ads, they have to pay money, sometimes in bitcoins. The purpose of an ads is to get people to know about a particular product or an offer. So, the website owner need to get as many people as possible to see those adverts. So, they are encouraging you to visit the site and view those ads. As you visit and view, they share the revenue with you in form of bitcoins. That's just how it works. Now, let's go into the details of how you can make money online just by claiming bitcoins from the faucets I will be revealing. Before I give other faucets, let me describe moonbitcoin cash in details so you know what to do on the platform. I believe by now, you've created an account on the moonbitcoin, if you haven't, go do just that. The interface is as shown on the featured image. Remember to use the same email address you used for Coinpot. Once you're signed in, you'll be prompted to claim your bitcoin if you are on the faucet. If not, not towards the top of the page where you have navigation links and click on faucet indicated in red on the featured image above. Once you're on the faucet, scroll down towards the end of the page and you'll see a green button indicated "Claim Now". Click on the button, enter the media recaptcha and hit the button "Claim", and gbam your bitcoin will be created to your Coinpot wallet automatically. Repeat this process every 5 minutes. The more you claim the more your earnings, because for every claim, you'll be given 3 tokens that will accumulate and can be converted to bitcoins also. So make sure you claim every five minutes. What Cay You Do To Speed Up Your Earnings? There are two major ways you can speed up your earnings on moonbitcoin.cash. One of the ways is by referring others and the other way is to perform simple tasks on the site such as visiting more faucets related to moonbitcoin and claim more bitcoin units or by clicking on the adverts you'll see once you click on the "Offer" link as indicated in orange colored box in the featured image above. There are some of the links that will lead you to casino sites, if you are comfortable playing casinos, you can try your luck. Some other links will lead you to survey sites where you can perform simple surveys with honest information and get rewarded in bitcoins. There is no limit to how much you can earn, your earning all depends on your effort. So give it a try and see if you'll not make more than 1 bitcoin in a month. Remember, 1 bitcoins is over 8,500 at the time of writing this article. To access your referral link, click on the "Referral" link indicated in green color in the featured image above. Share your referral link with your friends and family, encourage them to sign up and take the work as serious as yourself. You will earn 25% lifetime commission + 100% claim bonus from all your referrals. The more referrals you have, the more money you make. Share your referral links on social medias, blog about it if you have a blog, promote it in any possible avenue. This way you'll earn huge before the month ends. Remember 1 bitcoin is over 8000 dollars, and you can earn over 1 bitcoin in a month. 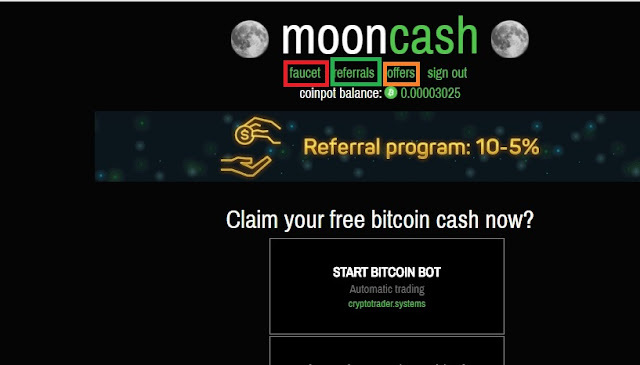 So, head over to moonbitcoin cash faucet and sign up right away and start making money in a cool way, right in the comfort of your home. Here is a list of other faucets that are connected with Coinpot wallet. Make sure to sign up for all of them and claim your free bitcoin units every 5 minutes. You determine how much you earn, so put more effort to earn big. Get people to sign up under you.